Welcome to my Music Diary – today for the 29th November! On the 29th November 2001, George Harrison died at the age of 58 years of lung cancer. The Beatles guitarist passed away in Los Angeles. Born on the 25th February 1943 in Liverpool, the very young Harrision joined at the age of 15 a band called The Quarrymen in 1958, which became in 1960 The Beatles. Beside the many hits, which were composed mainly by John Lennon und Paul McCartney, also George Harrision wrote some classics like „While My Guitar Gently Weeps“ (1968), „Here Comes the Sun“ and „Something“ (both 1969). After the break-up in 1970, George Harrison concentrated more on his solo career. After his two albums „Wonderwall Music“ (1968) and „Electronic Sound “ (1969) his third effort „All Things must Pass“ (3-LP-Set) marked his first solo work after the official end of The Beatles. This triple set features also the hit „My Sweet Lord“ (released in November 1970). In 1971 George Harrison organised the charity event „Concert for Bangladesh„, which took place on the 1st August 1971 at the Madison Square Garden in New York. Beside his music career, George Harrison worked also as a film producer. In 1978 he co-founded „HandMade Films„, which produced the classic „Monty Pyhton’s Life of Brian“ (1979). In 2011, the documentary „George Harrison: Living in the Material World“ by film director Martin Scorsese war released, which earned six nominations at the 64th Primetime Emmy Awards and winning two Emmy Awards for „Outstanding Nonfiction Special“ and „Outstanding Directing for Nonfiction Programming“. Welcome again to my personal Music Diary – today for the 30th October! Back in 2002 Mr. Nick Cave played a special solo show feat. Warren Ellis, Jim White and Norman Watt-Roy in Vienna at the wonderful Burgtheater. It was obvious that this “band” didn’t play a long time together – I do think it was the very first time that they performed officialy. The soundcheck was VERY long so the show started one hour late. 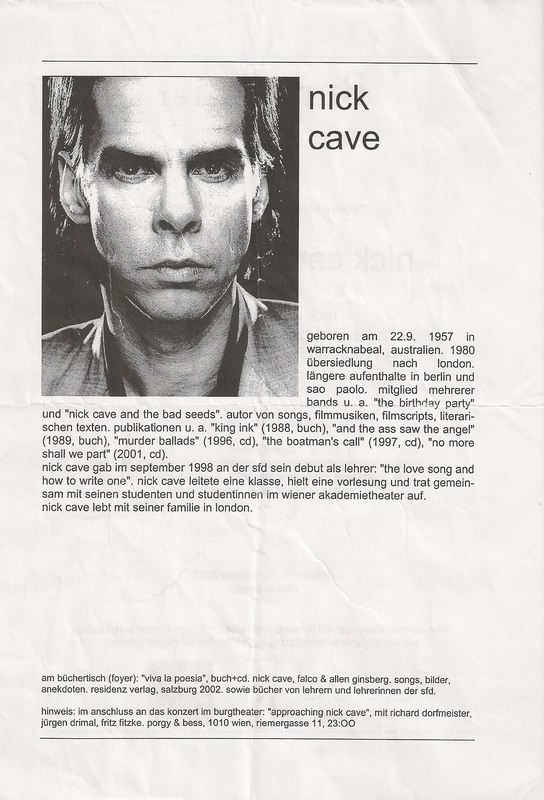 This performance was part of the 10th anniversary of the “schule für dichtung“, a school for poetry in Vienna for which Nick Cave did some lectures. Setlist, pictures and reviews from different newspapers can be seen here (just scroll down to the bottom of the page).